Remember the street you grew up on, or the park where you met your partner? Art can capture memories of cities that have special meaning. Collected Edition creates heirloom pieces by fusing modern fabrication techniques with traditional handcraft into maps of cities. Collected Edition is Kasia Wisniewski and Nick Foley. They met in 2009 at Pratt Institute while studying fashion and industrial design respectively. Kasia began her career by working for women’s luxury labels such as Vera Wang and J. Mendel, while Nick became the head of Product for NYC-based bike sharing system, Social Bicycles. Now they are turning their attention to Collected Edition. Utilitarian materials are transformed with the help of laser cutters, heat forming, and hand dyeing, resulting in a product that is much more than the sum of its parts. Remember the street you grew up on, or the park where you met your partner? Art can capture memories of cities that have special meaning. 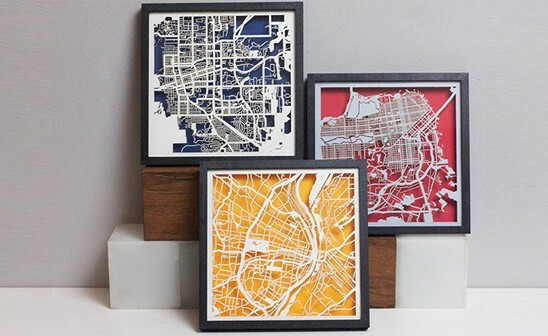 Collected Edition creates heirloom pieces by fusing modern fabrication techniques with traditional handcraft into maps of cities. 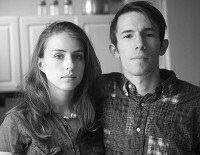 Collected Edition is Kasia Wisniewski and Nick Foley. They met in 2009 at Pratt Institute while studying fashion and industrial design respectively. Kasia began her career by working for women’s luxury labels such as Vera Wang and J. Mendel, while Nick became the head of Product for NYC-based bike sharing system, Social Bicycles.